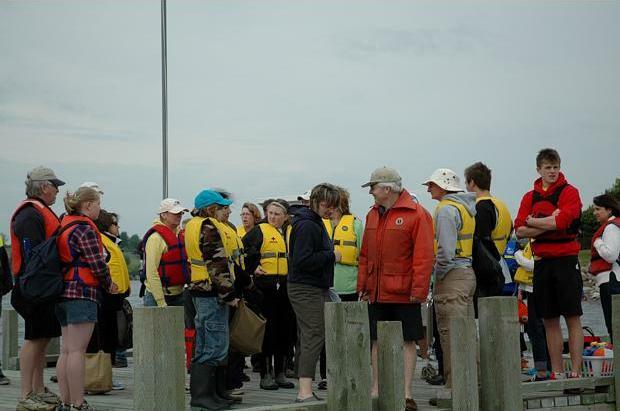 School students and parents on the dock of the Lunenburg Yacht Club for the trip to Backmans Island. The MICA Mission comes to Life! On Saturday, June 18th a group of 15 students from Mahone Bay's Bayview School and 15 parents were taken to Backmans Island for a picnic and nature tour of the island. Thanks must go to Syd Dumaresq, Chair of MICA's Education Committee and his wife, Sandy who organized this event through the Recreation Department of the Municipality of the District of Lunenburg. And despite a damp forecast, the weather was with us until we returned to the dock at the Lunenburg Yacht Club. Thanks must also go to Trudy Payne of the Recreation Department of the Municipality of the District of Lunenburg (MODL) who helped in the organization of the Event and to MODL who provided the insurance. Assisting her was Joel Holland, a summer student. The purpose was to educate the Grade 5 students about the importance of preserving the islands. And this purpose was well experienced by the students and adults alike. Combing the beaches, exploring the waters and a nature walk and talk across the island were capped by a wonderful hotdog roast with all the fixings!!! Rosemarie Lohnes of Helping Nature Heal led a rapt audience of students and parents through the woods and onto the far side of the Island. She highlighted the issue of erosion evident on Backmans explaining the causes - excessive water rise, higher tides, increasing storms and high winds as a consequence of global warming. As the walk proceeded into the interior of the island, much of the trail was blocked by downed trees felled by storms. Rosemarie explained that this process of "natural succession" opens up the canopy to light and air for new growth and new opportunities for wildlife. This process of regeneration - rot and decomposition - sends nutrients back into the soil. 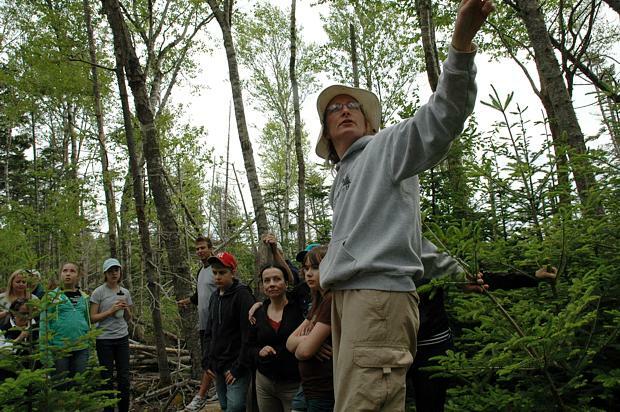 Rosemarie Lohnes of Helping Nature Heal leads students and parents through the woods. To quote one student as we walked through the woods "maybe we are walking where no man has walked before" and a girl's voice echoed back "or woman!" Several others contributed to the success of the day - Mike Smith, General Manager of the Lunenburg Yacht Club allowed Syd and his trusty cape boat, the Willet, to use the Club docks for departure and arrival. John Taylor, a friend of Syd's was master chef at the hot dock grill. Isaac Longard of Oakland was the lifeguard on duty who treated many a scratch from the walk in the woods! Wisely, Sandy and Syd informed the Coast Guard of the picnic. They checked into the Island event, shared some hotdogs and - and fortunately were there to tow Syd and the Willet off after going aground due to a departing tide!!! Out of this event comes two things - the intention of MICA to continue these educational trips to the Islands with the young students from the local schools. And the suggestion has been made that efforts be made to create a trail on the island, the original virtually gone and hard to navigate.